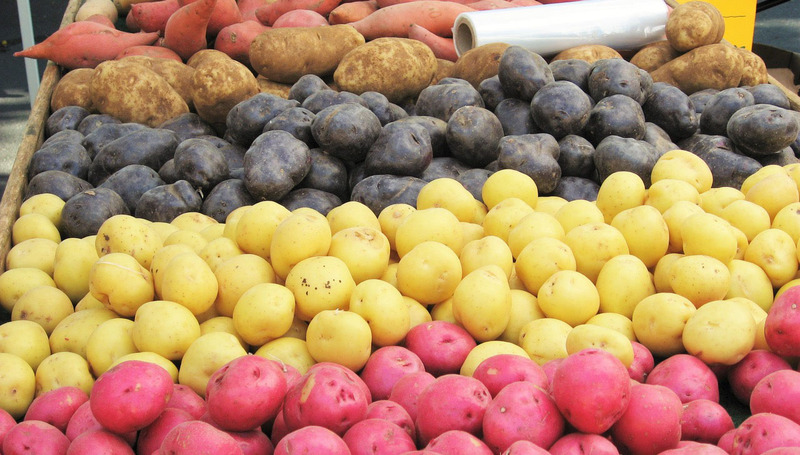 SAINT AUGUSTINE – Danny Johns, a fourth-generation potato farmer who owns Blue Sky Farms and grows more than 20 varieties of spring potatoes in St. Johns County, is hoping to add some pizzazz to the holiday staple. His unique, purple sweet potato variety is high in anthocyanin antioxidants and a bright contrast to the typical side of white spuds. And if you just served them over Thanksgiving, the new variety and color may be a very welcome change for your next family holiday meal. The farming business in St. Johns, Putnam and Flagler counties, known as the Tri-County Agricultural Area, is humming this time of year with many local farms harvesting alternative vegetables along with traditional staples like potatoes, greens and squash which contribute to a countywide agriculture economic impact of more than $1 billion per year based on a 2015 University of Florida report considering the entire food and agriculture sector, which includes food and forestry product manufacturing, distribution, mining and nature-based recreation. Many of those include Asian and hybrid vegetables and the demand for these nourishing vegetables has steadily increased over the past ten years meaning local farms are growing crops like bok choy, napa cabbage and daikon radish, while taking advantage of the productive farmland soil and longer growing season to export to Northern markets. St. Johns County Commissioner and fifth-generation farmer Jeb Smith is proud of the agriculture growth he has witnessed firsthand with young farmers coming to the area with specialty farming interests and degrees in niche management studies from colleges and universities. The new breed of entrepreneurial farmers often grow the exotic, harder to harvest crops in small farm plots and incorporate them into larger farms for the specializations and relationships. Terms like “slow food” and “farm to table” are catching on as “a delicious solution to climate change.” Food sold locally is better for the environment, because there is little to no transportation needed, which means fewer trucks and trains required to get the food to store shelves. St. Johns County is proud of its Agriculture Tourism Corridor that promotes the industry with farm tour events that educate the public about the county’s unique positioning with multi-generation family farms and exotic farms all benefitting from the productive soils here. The annual Tour de Farm in November included 50 local farms and was put on by Slow Food First Coast, a nonprofit working to save disappearing food products and to help people understand the importance of caring where food comes from and how it’s made. The food and agriculture sector, which includes industry support business such as Ag-Tastic, account for an estimated 19,000 jobs in St. Johns County according to a 2015 University of Florida report. With agricultural designations ranging from crop land to aquaculture to nurseries and livestock, there are 166,173 acres deemed agricultural with an assessed value of $52,597,000, according to the St. Johns County Property Appraiser. St. Johns County is being recognized as a great place to live with noteworthy accolades including CNN Money Magazine ranking it as number five of Top 25 Counties for Best Places to Live. This rapid migration of new residents has translated to 54 percent growth in the last 10 years. More residents mean a larger, closer buying public for local farmers. Taxes generated by the agriculture business help provide operating income to the county, which translates to services and infrastructure to support the public health and safety of the county. It’s known that wages earned by residents are often spent locally to support businesses and other organizations, which helps multiply the benefit of spending within a shared community. “Currently, less than 10 percent of American’s income is being spent on food. Farming is too important to us all to forget, and we must be strong advocates in support of farmers and producing our own agriculture industry,” said Bryan Jones, president of the Putnam/St. Johns Farm Bureau and a third-generation farmer at Riverdale Potato Farm in St. Augustine. He shares fellow community leader and farmer Jeb Smith’s excitement about young farmers coming into the area. Jones believes younger farmers are more apt to share knowledge and help each other at their farming, production and income levels. From a consumer standpoint, winter vegetables are plentiful now including locally-grown crops like green beans, brussels sprouts and an assortment of sweet, exotic potatoes. As families and friends gather around the holiday table, the season’s vegetables are not only a kinder choice for optimum health, but also for the health of the First Coast economy. “It’s important that First Coast residents eat and request local when they can,” said Dinkins. “That may be stopping by a neighborhood farmers’ market, asking your grocery store’s manager to source local for a particular item, or sign up for a farm bag delivery service.” In the 12thmonth of the year that often proves hardest to be healthy, local farmers are doing their best to share many delicious and wholesome holiday table alternatives.